The Humidipak System is the ultimate two-way humidity maintenance device for musical instruments. The Humidipak packets consist of a formulated salt, water, and gel solution contained in a leak-proof water vapor-permeable membrane. Based on scientific principles, the saturated solution will maintain a constant level of 45%-50% relative humidity within a sealed environment (your instrument case) without damaging fluctuations in humidity. The Humidipak System will actually dispense vapor as the humidity level goes down while at the same time absorb vapor when the humidity level rises within the instrument case. 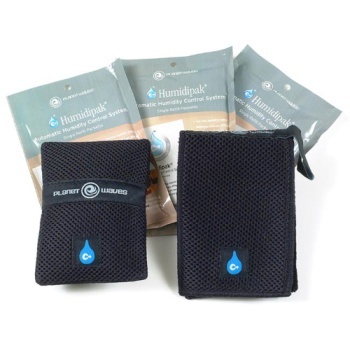 The Humidipak membrane itself ensures purity while providing water vapor transmission. The membrane acts much like the filtration used in water purification systems by inhibiting the passage of soluble substances (like salt) and by allowing only pure water vapor to pass in and out of the membrane as the solution responds to the changes in the ambient environment.